A trainee reporter found himself a “footnote to history” in a week where he faced everything the elements could throw at him. 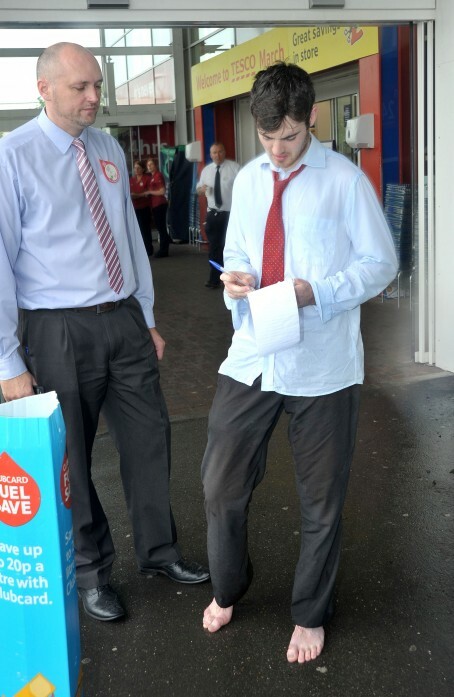 Cambridgeshire Times and Wisbech Standard junior James Podesta was one of the first at the scene when a supermarket copped the tail end of Hurricane Bertha. The storm-force winds and 50mm of rain falling in a few hours brought flooding to the Tesco store in the Isle of Ely market town of March – and James in hot pursuit of a story. While Wellington boots might have been the sensible attire in the appalling conditions, the 25-year-old had gone to work in his “expensive” brogues. But he quickly slipped them off to go “barefoot in the aisles” as he quizzed the nonplussed grocery store manager Mark Steele about flood damage and the evacuation of 500 customers. Photographer Steve Williams, who was with James on the assignment, said: “We got there, parked in a massive puddle, and suddenly James had removed his shoes and socks and was out of the car to find the manager. “I was gobsmacked – but looking back on it I suppose it made some sort of sense”. The floods kept the small Fenland news team busy until late into Friday evening, with editor John Elworthy and Steve cancelling their weekend plans to maintain a steady flow of updates to the papers’ websites. Their efforts paid off with 100,000 web hits within the space of 36 hours and new web records for both titles. A ‘tweet’ for readers’ photographs sparked an avalanche of flood-hit Fenland images – more than 200 photos came in during the weekend and two thirds of them were sifted into on line galleries. And the moral of the story – it’s an ill wind that blows nobody any good. For after James’s barefoot bravery through the storm – the result of his NQJ exam proved a stroll in the park. “James had further cause to smile this week when he received the news he’d passed his National Qualification in Journalism exams,” added his editor John. “He’s been with us 21 months now and he’s certainly a good chap to have on board,” added John. Didn’t have a pencil with him for taking notes when it is wet. The moral of this story, “it’s an ill wind, etc”, would be appropriate if the facts were true. The flooding actually happened on Friday/Saturday, August 8 and 9, at least 24 hours before ex-Hurricane Bertha (not Bethesda) arrived on the scene. There was certainly an enormous amount of rain in a few hours but not a breath of wind. That arrived a day later. As they say, never let the facts get in the way of a good story. The actual coverage of the event was excellent and deserved to set a new record for web hits. It was a good story but this incident actually happened at least 24 hours before ex-Hurricane Bertha (not Bethesda) arrived on the scene. There was certainly an enormous amount of rain but not a breath of wind and the “it’s an ill wind” moral is inappropriate. There doesn’t appear to be even the merest hint of any water in the photo – so why didn’t he put his shoes back on (after all, the person he’s interviewing seems to be managing quite well)! And if he were one of my reporters, I’d suggest that James might also tuck his shirt in and try to look a little less scruffy. Going barefoot I can understand, the skew-whiff tie I can deal with in the circumstances, but I’m struggling to find any excuse for the untucked shirt, ‘hurricane’ or no ‘hurricane’. Smarten up, youngsters! Did he also untuck his shirt because of the weather? Looks like he’s wearing his dad’s clothes. Top button undone too – wind must have carried it away. I remember experiencing some heavy rain on a paper I once worked on. There were huge puddles, people huddled in doorways and anyone caught in the shower was soaked. It took ages for everything to dry out. I didn’t take off my shoes but, like James I paddled through water several inches deep across the car park of the local Tesco and managed to interview the assistant under-manager (soft fruits) who was able to tell me exclusively to ‘ring head office in Cheshunt for any comment’. Unfortunately, what we dubbed ‘The Great Oxdown Downpour’ occurred the day the paper came out, so a week later no one was really that bothered, so we spiked it. Pity really as I ruined a nice pair of Hush Puppies. Didn’t think to roll up his trousers? People on the front line are the face of the paper, you need to look respectable at all times. Tuck your shirt in, fix your tie, do up the cuffs and put your shoes back on. Hey everyone, get off the lad’s case. Well done James – you did what you needed to do in order to get the story. We were all trainees at one point and I’m not sure everyone would have done the same! When I was faced with similar many moons ago” i hopped onto the photographer’s back so he could carry me as he had a car boot full of stuff to cope with all situations – including the all important pair of wellies! Good on you lad – most journos can’t even be bothered to leave the office these days. I trust the Health and Safety Executive will be taking action against his employers for failing to provide him with the necessary protective clothing. Surely they could have allowed him to buy a cheap pair of wellies on expenses.In fact, Tesco does them for £14. Of course, he could have just phoned the store.